Hello polished world! How are you all on this fine Wednesday? Just a few more days and the weekend will be here! When I'm at work, I feel like the workday flies, but then I sit back and think "omg it's seriously only Wednesday." With how fast everything has been going, it should be at least Thursday. Regardless, today is Wednesday and I am here to post with The Beauty Buffs! Today our theme if Floral. If you know me, you know I LOOOVE floral manicures! Dot flowers, roses, splash flowers, you name it, I love it. Since I already have done a rose manicure for The Beauty Buffs during Coral week, I decided to do a different floral print. While I love my roses, I wanted to try something a little new! Lately on Instagram I have seen sooo many girls who have had daisy accent nails. 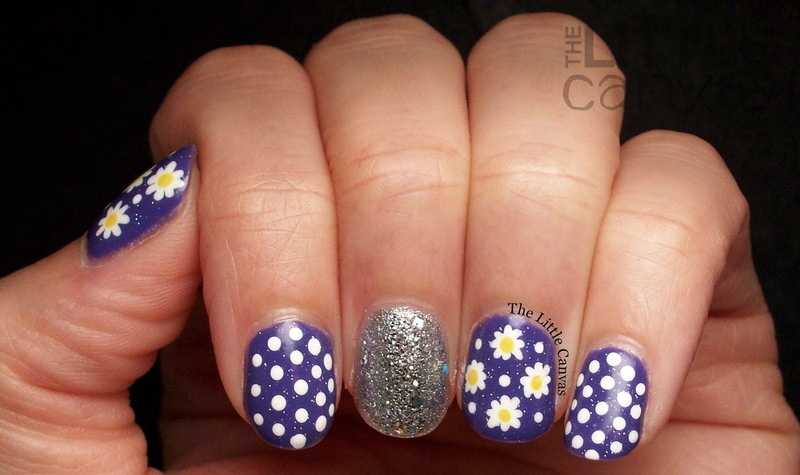 Typically the daisy nail is framed with polka dots, which again is something I love. My Instagram sleuthing has led me to believe that this manicure was created by Trendy Polish, but honestly t's such a simple design, I really can't say this is this person's, and so on and so forth. Literally, I've seen it on at least ten separate accounts in the past month. Anywho, since I loved the pattern and the overall design of this floral manicure, I knew I had to do it and share it with all you lovelies today! I grabbed a pretty new polish from the NYC New York Color Samba Collection and got to work! Let's take a look! Isn't it pretty?? I'm really loving the base color of Jacaranda Flower from the City Samba Collection. It's such a deep purple, but still bright for summer. It's truly unlike any other purple polish I own. When I first received it, I thought to myself that it was very similar to other drug store polishes I owned, but it has a more blue purple color when on the nail. It applied evenly in two coats, but for my manicure I used three since I really wanted the color to pop. While the polishes from this collection are quick dry, I didn't think it dried any faster than my bottles of Sinful Colors. Maybe it was the humidity that day, but I thought my top coat dried faster. Once I added the INM Northern Lights, it dried super faster. Fellow Beauty Buff Jacqui from Crafty Nail asked me about this polish yesterday, and I'm so happy to hear she's adding it to her collection. 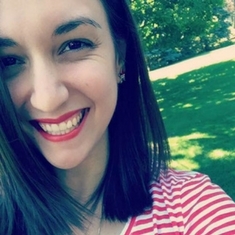 I truly don't think she will be sorry, and that goes for all you lovelies reading this post. If you use China Glaze Fairy Dust and love it, then you will be blown away by this topper. Literally it's a fast dry, non smelly Fairy Dust!! Enough of me babbling about the polishes, I should probably talk about the floral part of this manicure since that is what this post is all about! 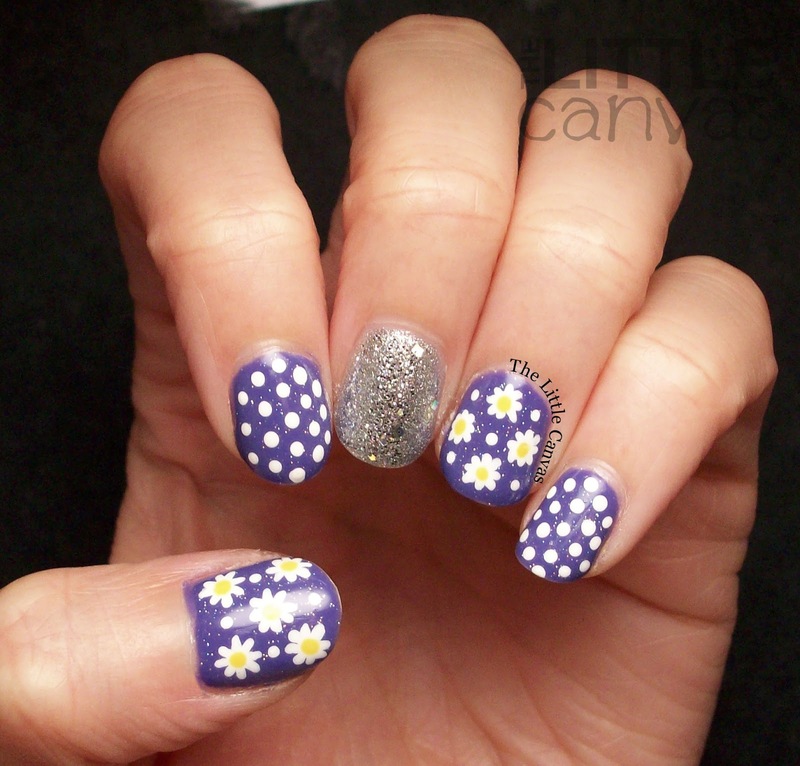 The daisies were super easy and in my opinion super adorable. With my small nail art brush, I created a mini "+" on my nail. I then went and drew a little "x" through it. Once it was dried, with my smallest dotting tool, I added the yellow middles using Copabanana. 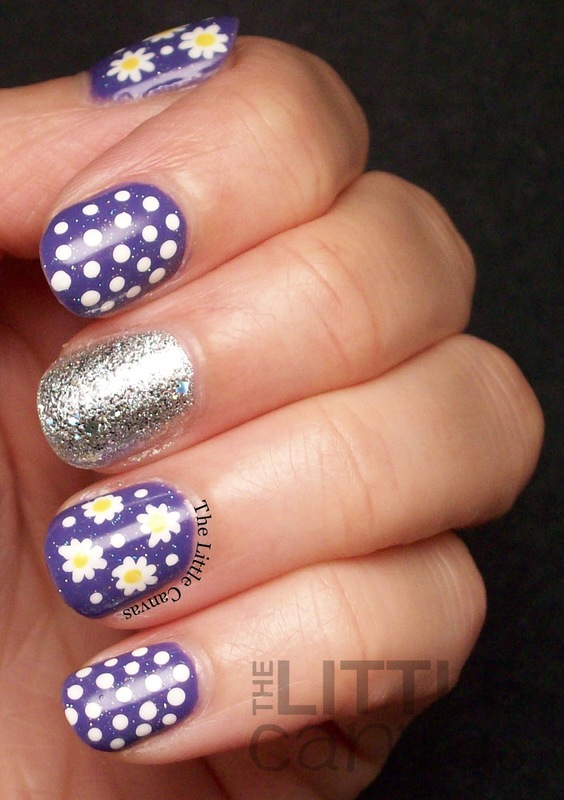 The nail looked a little weird to me though, so I went through and added the dots in between the flowers. I really think that helped tie the whole manicure together and made it really match the other nails. What do you think? 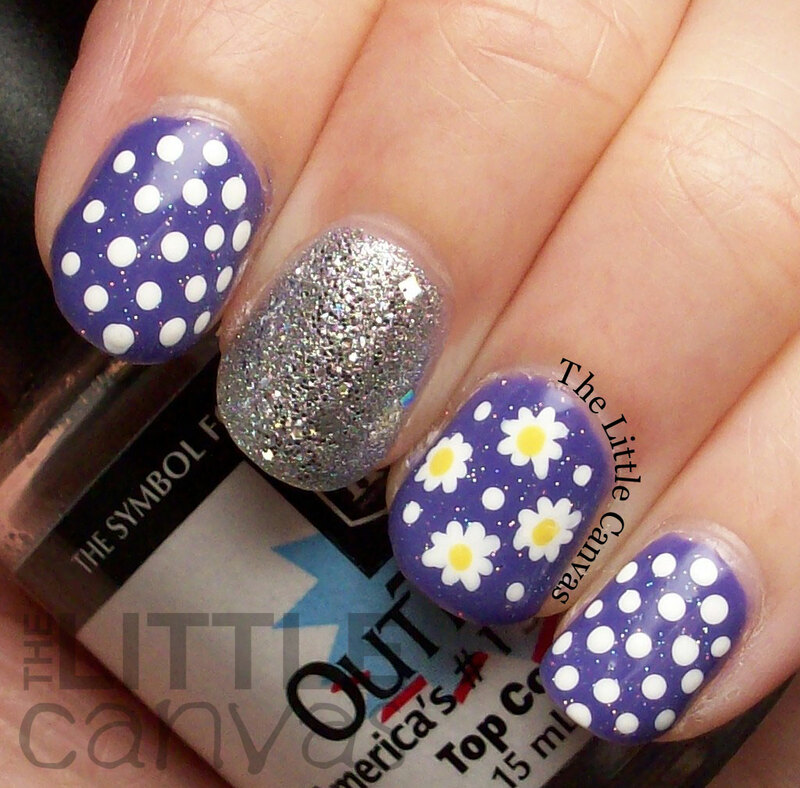 Loving this floral/polka dot manicure? Loving that base color? 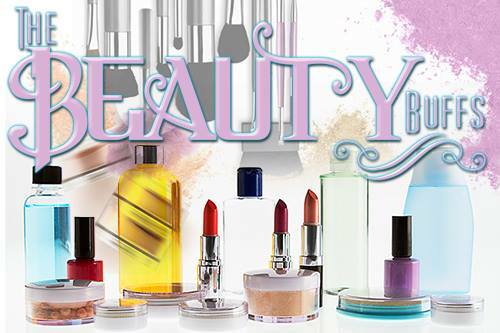 I am sure I am going to be blown away by the other Beauty Buffs posts! Make sure to check them out!